with a broken furnace and no heat on the first floor. Aren’t furnaces suppose to last more than four years?? Thank goodness for warranties…though that’s not keeping us warm while we wait for parts. Also, I was on my way to do some marathon shopping and my car battery died. Seventy seven dollars of my shopping money went to a new battery! Happy New Years To Us!! We have so much to grateful for this year. A little bit of a rough start won’t damper my spirits!! Providence Ltd Design. to celebrate the grand opening of her new on-line shop. Mona donated a beautiful vintage necklace for me to giveaway on my blog. I have wanted a vintage breadboard for the longest time and Mona had one for sale in her shop. I was so excited to finally find one and I ordered it right away. Imagine my surprise when she told me this wonderful piece would be a gift from her. This is just more evidence of how very kind and generous our family of bloggers are. Thank you Mona for this wonderful gift and for your friendship and support this past year. Isn’t the breadboard wonderful? I am displaying it in an antique artillery basket I already owned. I must admit I got this idea from Marci at Antique Chase. When I saw the picture of her boards displayed this way I just fell in love! I am on my way to sit in front of the fireplace and stay warm. A wonderful gift. Bloggers are truly a generous group. Love how you have your new (old) cutting board displayed. Happy New Year! Now that you got all the bad things going to happen to you in 2011 out of the way… you can get on with the joyfulliving! I pray that all inconveniences are behind you. Your bread board and fabulous basket are gorgeous! I would love that in my kitchen. What a beautiful and generous gift. How exciting! Love your bread board and basket! Thanks for linking me as your inspiration! So nice of you! love your board,,,,i have a new one i am going to try to age, when my shoulder heals. What a great gift. I love old pizza boards or bread boards and love the artillery basket. Oh My!! You are one lucky girl. Mona is a jewel isn't she. I just love her. You did have a bit of a rough start, but I love your attitude!! I am having a nice quiet day blog hopping and staying cozy in from the rain, Yes it does rain in Calif,hehe. I just started reading your blog and do enjoy it. I am sorry about your furnace and car. Love the bread board and how you have it displayed. How sweet of her to give you the bread board as a gift. Bloggers are indeed wonderful people! I see that you have a basket like mine. I'm so glad that you told me what it was. I love how you are using yours. It's always something, isn't it? I hope your heater doesn't end up costing too much. We just replaced ours last week…after 20 years, yikes! I wasn't looking forward to that. Thank you so much for visiting with me and your comments. I'm going to be back to visit you and to keep up on what you're doing. Beatufiful Blog! Your bread board is so sweet! What a wonderful gift! What a fantastic gift, it looks perfect in that basket. Yes…perfect! My car is going in tomorrow morning, I hate to think what the costs might be. Glad you got away with just a battery. Neat, neat board. Like the way it is stenciled. We have things break down that is less than 2 years old. They just don't make it like they used to. Aren't totally unexpected gifts just the best. I hope your parts don't take too long. A few years ago we came home to the heater not working in the house that had been empty for 10 days. You could see your breath inside the house. Here is hoping you are warm soon. That is beautiful. I hope the get the parts to you furnace soon & Happy New Year. I love the breadboard and it looks great in the artillery basket! Hope your furnace is working now, Pa is in a hear wave 34 today! Oh that bread board is awesome! We bake a lot of bread so I would love to find one like that. Oh I am dying, DYING over your breadboard. Love it! I saw this over at Antique Chase too, and now I feel I've got to find one! It's a wonderful way to display the bread board. Our furnace quit over the holidays too…hmm must be something in the air! Your bread board is beautiful and what a thoughtful gift! Happy New Year…this year we will definitely meet up for lunch! You know they say when it rains it poors! Hoping it stops raining for you and you enjoy some sunshine 🙂 I love your bread board. I've seen a few repro's, but to get the real deal is way cool. And I love your amo basket, too (I have three…you can never have too much-lol). Lucky you and what a great blog friend! Wishing you a Healthy and Happy New Year! That's one big bread board!!! What great patina. 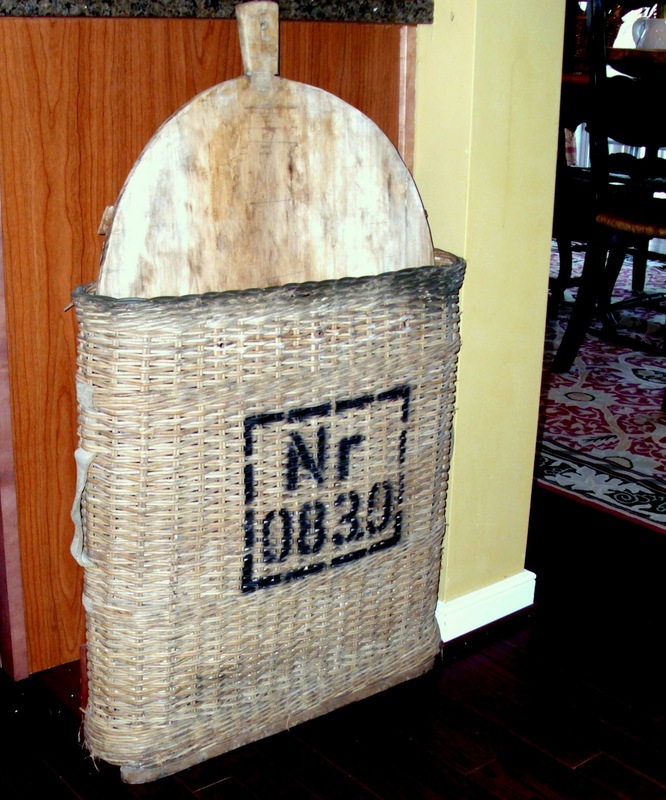 And I love that basket, great idea, the stenciling is so cool. Thanks for linking up, Sherry! Thanks for visiting my blog and commenting. I appreciate it so much! I am glad to have discovered yours. I hope your January will be a little less stressful with nothing else breaking! What a beautiful gift…and I love the way you have displayed it! Gorgeous.